The solution to disable or delete Hiberfil.sys on Windows 8.1, 8 or Windows 10! When you have a SSD, you don't need the hiberfil.sys, since starting with SSD is pretty fast anyway! So, the best is, to delete eg. disable hiberfil.sys in Windows 8.1 / 8. 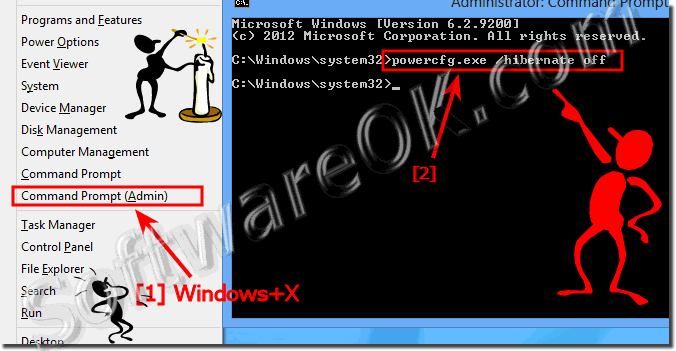 Start the Windows-8/8.1 and 10 cmd prompt in administrative mode via shortcut keys [Windows+X], then in the command prompt simply enter the command: powercfg.exe /hibernate off ! This solution is also for Windows 7, 8, 8.1, Vista and Server 2008, 2012! ... Customize the paging file pagefile.sys in Windows 8.1 and 8! ... disable or enable Hibernate and Sleep at Windows 8 and 8.1! ... Auto Shutdown in Windows-8 und 8.1! ... turn off the Windows 8, or shut down the Windows 8! (Image-1) Delete eg. disable Hiberfil.sys on Windows 8.1and 8! Windows-8 - FAQ-144: Hiberfil.sys to another drive because my C: on SSD is full (Windows 8.1 / 8)! Hiberfil.sys move to another drive? Hiberfil.sys remove im windows 8.1? Where is the hibersys file in win 8.1? Delete file hiberfil.sys windows 8.1? Move hiberfil.sys windows 8 and/or Remove hiberfil.sys windows 8.1? How can delete hiberfil.sys in windows 8.1? How to change hybernation file location windows 8.1? Windows 8.1 hibernation file and how to delete a file hiberfil.sys from windows 8.1? Hiberfil.sys windows 8.1 where to Move hiberfil.sys windows 8.1 different drive? Is hiberfil.sys needed on windows 8.1 ssd or delete hiberfil.sys windows 8? Disable hibernation on ssd windows 8? How to change hiberfil to another drive? Hyerfil beng used by another? Windows 8.1 ssd optimization hiberfil.sys? Win 8.1 delete hiberfil,sys, hoe to? Can I Windows 8.1 kill hiberfil? Can I in Win8.1 hiberfil disable? Can I Hiberfil.sys. mancante ssd? Windows 8.1 delete hiberfil.sys for ever? Move hiberfil to another drive? Hybernation file on different drive? Move hiberfil.sys to secondary drive win8? Win10 hiberfil.sys move to D? Save hyberfile.sys to another drive?